Michael Dunlop will be the man to beat on the Bennetts Suzuki at Armoy. Michael Dunlop will ride the Bennetts Suzuki at the ‘Race of Legends’ at Armoy as he targets a record seventh consecutive victory in the feature race. Dunlop will start as the red-hot favourite on the GSX-R1000 at his home meeting as he aims for more glory following his Senior TT triumph last month a hat-trick at the Southern 100 on the Isle of Man, where he raised the outright lap record at Billown to 115.707mph. Dunlop is also entered in the Supersport races on his MD Racing Yamaha, although Guy Martin – who had been entered by Honda – will miss the event. The Lincolnshire rider is also confirmed as a non-starter at next month’s MCE Ulster Grand Prix. Dunlop sets the benchmark at Armoy, where his opposition will include older brother William on the Temple Golf Club Yamaha and McAdoo Kawasaki’s James Cowton, plus southern Irish riders Derek McGee and Michael Sweeney. However, Derek Sheils, who clinched a double yesterday at Faugheen, is a doubt due to his commitments at a friend’s wedding. Armoy Clerk of the Course Bill Kennedy said: “I’m absolutely delighted that Michael will be racing this year and vying for the sought after title of ‘Roadside Kia Race of Legends Winner’. “Michael has done exceptionally well this year particularly at the TT and the Southern 100, where he set a new race record pace and a new lap record. “I’ve no doubt Michael will be on fine form at Armoy,” added Kennedy. “This year’s meeting is shaping up to be a really good event. We’ve got riders from all over the UK and the South and I am confident that we are going to see some exceptional road racing again this year. 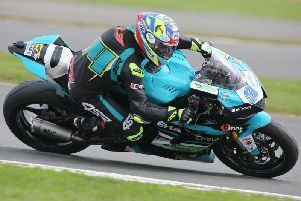 A number of international newcomers include Mathias Winkenjohann from Germany, who will ride in the Senior Support race, plus fellow countryman Chris Meyer, who has entered the Moto3 (125GP) race. Patricia Fernandez from the USA will ride in the Supersport and Open races while Roger Chen from Taiwan will fulfil his ambition to race at Armoy in the Classic races. Two races are scheduled during the course of practice on Friday evening with the Park Electrical Service and Armoy Construction Senior Support Race and the First4Printing Supersport 600 Race. Kennedy added: “ If our VIP corporate hospitality is anything to go by, we have folk from as far away as Norway, Italy, Aberdeen and Wexford. Roads close at 12.30pm on Friday for practice and from 10am on Saturday for the main race programme.